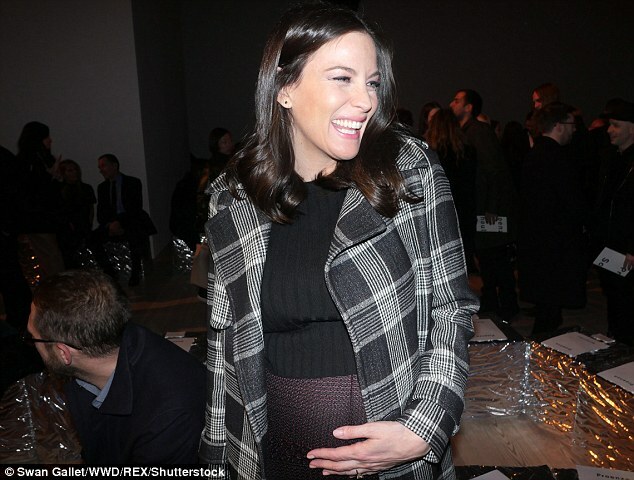 She only revealed her pregnancy last month but Liv Tyler’s baby bump was in full bloom on Wednesday. The 38-year-old actress had her blossoming belly on display as she attended the Proenza Schouler Fall/Winter 2016 fashion show in New York City. Liv wore a form-fitting skirt and sweater which highlighted her bun in the oven as she sat front row at the star-studded runway show. Liv is expecting her third child with her fiance David Gardner. The couple share one-year-old son Sailor and she has another son, Milo, nine, from a previous marriage. The award-winning actress donned a knit midi skirt which was plum-coloured but included a black trim that matched her sweater. The brunette beauty left her silky shoulder length mane hit just below her shoulders and went with minimal make-up which highlighted her natural beauty. Finishing off her look, the Leftovers star draped a black and white plaid coat over her wardrobe and accessorized with a leather handbag and black heels. Also in attendance at the presentation was Vogue editor Anna Wintour and her stunning daughter, Bee Shaffer. The mother-daughter duo sat closely next to each other while they took in the fashions, as Anna wore a long animal print coat.